Dayton, July 7 2018 - Emiel Wendt was scouted in March during the annual Dutch Lions FC try-outs in Roosendaal (the Netherlands). 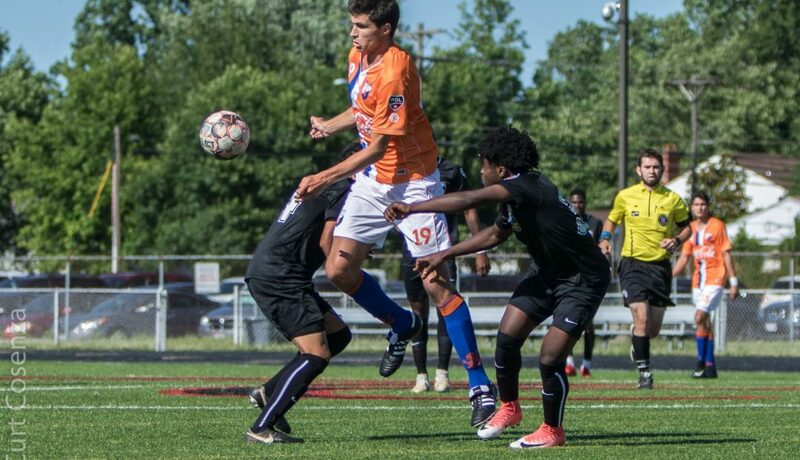 After winning the Division Championship with his team vv Noordwijk in the top-amateur league, he is now close to winning his second Championship only 2 months later with Dayton Dutch Lions FC. With his two goals vs Michigan Bucks last week he gave the Lions a crucial point after trailing 0-2. We asked Emiel about his experience in the US sofar. How was the transition from finishing your season in Holland and then flying straight to the USA? Well, I flew directly a day after winning the competition on Saturday with my team vv Noordwijk in the Netherlands. That was off course quite a switch, from champion at my local club one day, to a new team -Dayton Dutch Lions FC - at the other side of the world the other day. The first practice my new teammates did not know what to expect from me, and they just called me “big man” because I am 6’5 (1,96m) tall, but after some 6 v 6 scrimmages they found out that I am perfectly able to score goals haha! What is your impression of the League (USL PDL) sofar? There are some good technical skilled players in this league. The teams that play soccer by passing the balls using the midfielders to connect (from defense to create chances near and inside the box) perform better than the teams playing “kick and rush” only. Defensively, many teams can improve the way of putting pressure on the ball together as a whole. What are the biggest differences compared to playing in Holland? The biggest difference compared to the Netherlands is that you are playing soccer almost every day and have multiple matches a week. Spending a lot of time being busy with playing soccer is great! But the labor/rest ratio is very different. Besides that, we need to travel a lot further to play away games (like 4/5 hours), because they are often in other states. But for me personally it is also a nice way to see more of the country, and play at other club’s facilities (mostly at high school stadiums. And once the locker rooms were at the local swimming pool. Where are you staying in Dayton? I am staying at the farmhouse of majority owner Dr. Suresh Gupta at Yankee Road with five other players: José Labanino from Cuba, Antoine Ravera from France, JJ Williams and Jacob Moore from the USA, and Mats Wolthuis from the Netherlands (just like me). It is a big villa with plenty of room for us! We have five bedrooms, four bathrooms, a large living room, and even an eightball table in the basement. How is the atmosphere in the team? Great! In a winning team, the atmosphere is always great haha. Although we have a group of around 40 players and only 18 are on the roster for the games, everyone works hard and tries to keep the first 18 focused for the next game during practice. You are close to winning the Conference Championship next week but there are still five teams in the race, what are your expectations for the last two games? With 4 points ahead and two games to go we have it in our own hands to win the Conference Championship. Both games against Cincinnati Dutch Lions (away) and Lansing United (home) will be hard. However, we are on top for a reason! We are going to give our best and show them why! What has been your best experience sofar in the months that you have been in Dayton? Regardig soccer I have two special moments (of plenty) that I would like to mention. The first one is my first goal in my first game. Described in the match recap as: “In the 84th minute, the Lions had a throw-in and Bradley Schluter (Centerville, OH/Dynamo) had a good throw into the box. Emiel Wendt (vv Noordwijk, the Netherlands) was able to trap and turn with his first touch, he then cut the second defender and slotted the ball far post to put the game away. A 2-0 lead with just under 5 to play guaranteed the Lions their second away win and a three-game win streak.” Definetely a nice way to start becoming part of the team! The other moment is the home game against Michigan Bucks. With 40 minutes to play I got subbed on with a 0-1 on the scorebord. Within5 minutes I scored a head from a great serve of the right back Abdul Kooistra. Unfortunately, we conceded a goal in the 82nd minute, and the Bucks were celebrating it as it was the game winning goal. In the 84th minute, after some good pre-work of Sam Deroy, Jacob Moore assisted me in the box where I scored a brace and the equalizer. I was named Dayton Dutch Lions FC Man of the Match, and the second goal was suggested as PDL goal of the week. Furthermore, I was picked for the Central Conference Team of the Week. All in all, this was a really good week! What can you tell other players in Holland that would like to play in the USL PDL League next year? It is an awesome experience to play soccer in this 3rdDivision (summer) League in the States. I am able to play soccer with guys from 14 different countries. We all love the beautiful game called soccer and I am certainly having fun playing it! We wish Emiel all the best in the upcoming two regular season games!